Iron Lady of the South Atlantic? In March, as the bells tolled, the people of Britain remembered Margaret Thatcher for better or for worse. She was also remembered in the South Atlantic by the Falkland Islanders who owe their continuing autonomy to Mrs T’s resolve in 1982. In another part of the South Atlantic the people of Argentina should have given thanks to the grocer’s daughter for the role she played in bringing down the Junta. The Iron Lady believed in democracy, she believed in doing what was right and in doing so opened the way for the return to democracy in Argentina. The Falkland Islands were catapulted to prominence following the Argentine invasion in 1982. The war changed the British view of the Islands; they were no longer inconvenient smudges on the map to be sloughed off; they became the manifestation of Thatcher’s revitalised Britain. I never visited Argentina during that period of new democracy but I got a sense that Les Malvinas were not, at that time, a national issue. People were focussed on democracy and the economy. In the 90’s, I enjoyed very amicable relations with the Argentinian officers with whom I worked on various overseas military missions. The Falkland Islands were rarely mentioned and we spent more time reminiscing about Maradona’s “hand of god” goal in 1986. Another Argentine politician, Senator Daniel Filmus described the vote as a “publicity stunt”. He said “We must denounce this trickery that pretends to represent the popular participation of an implanted population.” These are extraordinary remarks from the child of European immigrants, who now acts as a democratic leader. The question which perplexes me is why do the Argentinian leaders expend such energy on the issue of Les Malvinas? England and France came to working arrangements over the Channel Islands, which are only tens of miles offshore, many centuries ago. Is it the sense of loss? Hardly. The Falkland Islands are 500 kilometres away from the Argentine mainland – apply that in Europe and it takes you from Dover to the town of Wiesbaden in Germany. They were never continuously settled by Argentinians and it appears to have been a dead issue between 1849 – 1941. There is no emotional similarity to the forced division of Ireland or Germany. Is it a useful means to divert the Argentine population from the economic woes? Perhaps. The Argentine economy is struggling with reduced growth (2.6%) and rising inflation with an official figure of 10.5% – disputed by the International Monetary Fund – and the real figure assessed to be around 25%. Difficult days for the majority of the population. Is it a means of capitalising on the South Atlantic oil bonanza? Possibly. It is estimated that the Falkland Islands could receive up to $10 billion in tax revenues and royalties over a 25 year period. However the Argentine economy is rated at 22 in the world with a GDP of $474 billion, which makes the Falkland Island oil income a mere drop in the ocean. Is it to enhance de Kirchner’s personal standing? Probably. Christina de Kirchner has set her sights on changing the Argentine constitution to enable her to have a third, and who knows possibly fourth consecutive, term in office. But she is beset with falling ratings and accusations of corruption in the Argentine media. 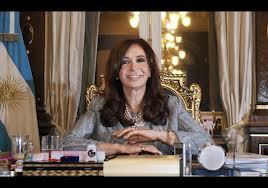 Who could blame her if she aspired to portray herself as Argentina’s Iron Lady by reclaiming Les Malvinas? The problem is that de Kirchner has no chance of achieving this and runs the very real risk of making herself look naive in the world’s eye. The Falkland’s issue is deadlocked with de Kirchner refusing to hold discussions with the Islanders, the British Government refusing to hold discussions without the Islanders, and the Islanders refusing to hold discussions on sovereignty issues. Meanwhile the UN and the US sit on the sidelines encouraging the parties to find a resolution, in the knowledge that there is little they can either do or want to do to influence matters. Ironically, the only person who could break the deadlock is de Kirchner herself. If she took the long view and studied the work of the British and Irish governments, in the run up to the Good Friday Agreement of 1998 and the subsequent amendment to Articles 2 and 3 of the Irish Constitution in 1999, she might be able to come up with a cunning plan to normalise the South Atlantic to everyone’s mutual benefit and great personal acclaim as a stateswoman. Is President Cristina de Kirchner brave enough to take bold decisions? Only time will tell if she can become Argentina’s Iron Lady. This entry was posted in Falkland Islands and tagged christina de Kirchner, dispute resolution, Falkland Islands, Falkland Islands territorial dispute, Falklands vote, Felix Spender, Iron Lady, Las Malvinas, Margret Thatcher, north light solutions by gfas2010. Bookmark the permalink. Barney, thanks. You make very valid point about Thatcher and I think you would have to look at her actions with Chile and South Africa in the context of the geopolitics of the 1970s. She was not perfect and made misjudgements, particularly in the later part of her political career, but I don’t think that detracts from my view that Thatcher generally did what was right for Britain and her dependencies. The issue of the 14 British Overseas Territories is interesting. They are the remaining fragments from the age of expansion resulting from international treaty or colonisation, that have not acquired independence or voted to remain British. The key point is that they all have their own internal leadership and are mostly self governing. The integration of these territories into the UK would be a retrograde step and a move away from the UK’s principle of self determination. The final category are the Crown Dependencies of the Channel Islands and the Isle of Man. These ancient governments are linked to the English Crown and not the British Crown so they are not part of the UK and would resist any such integration. Interestingly, they are not part of the EU as I found out during a very shouty argument with the French customs while sailing last year. History throws up a patch work of interesting legacies that just have to be gently managed.